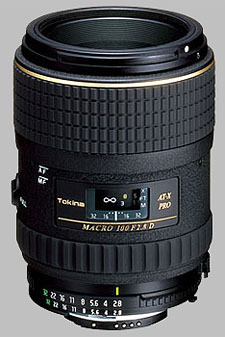 (From Tokina lens literature) The AT-X 100 PRO D is a new macro lens capable of life-sized (1:1) reproduction at 11.8 in. (30 cm). The lens' multi-coating have been re-engineered to match the highly reflective silicon based CCD and CMOS sensors in today's digital SLR cameras. This lens gives the best of both worlds because optics still give full coverage and excellent sharpness on 35mm film. A macro lens that can handle both the digital and film worlds with ease. This macro lens focuses fast enough on the Nikon D7200. Image quality even better than the Sigma 150mm Macro Lens. Focus Ring/AF-M Switch very usable for final focusing. The lens feels compact with good balance on the camera. Excellent value. a great macro lens. better than my nikkor 105/2.8 in terms of build quality. it produces sharp & beautiful images. Bokeh are wonderfull & buttery smooth. Tone reproduction are great. For the price, it's a must have. no brainer! Excellent lens. I'm very impressed with the build quality and handling of the lens. I've used it for just a few days so don't have any comparison images yet but wide open it is definitely quite sharp and the contrast is very good. The lens will not auto focus on Nikon bodies such as my D5000 and can take some trials to get a sharp image hand held. Using the magnified live view and a tripod I can get the focus spot on. A pleasure to use! Highly recommended lens for its price and quality. Sharp image, solid built. I have used this lens for almost a year now.This is an excellent lens, very well build and balance and very nice image quality for the price. To me, it produces warmer images than Canon lenses and sharpness is almost the same. It shows some CA when wide open. However, if you are buying this for macro shots ( which it's designed for) you probably will not use AF and you will use it in smaller apertures. I am using a Canon version and I am happy I saved some money instead of buying the more expensive Canon, which has a lot faster AF and less CA. I believe when this lens is mounted on Canon EOS Digital, it drains battery (at least on my camera), but I searched the web and I just found one complain about this problem with Tokina lenses in canon mount. High image quality and good construction len. Slow AF may be a little problem but it's not significant. In this price, has a lot of choice, check your Canon's or Nikon's first is my suggestion. capable of this?? really disagree with the suggestion that a zoom with an extension would give similar results, actually thats absurd in my opinion. This is a classic macro lens highly recommend. It is very simmular in sharpness to the tamron 90 macro I have used in the past. i got this instead of a nikon mainly because i couldnt afford a nikon! but i havent had any regrets getting this lens. build quality is good, more favourable than other 3rd party lens. it's sharp as expected from a macro but focusing is kind of slow(as with most macros too) it's a good makeshift portrait lens too. the push button to switch from af to mf can be handy at times. overall, i'll recommend this to anyone! I opted for this lens over the canon based on price. Overall I am happy with the lens. It suffers the same maladies as other macros - very slow to focus and a lot of hunting beyond macro focus lengths - the limit switch helps, but not as much as someone without macro lens experience might think . The only other complaint I have is that in bright light, colors seem more muted than they should be. The large focus ring is nice. When you are manually focusing on bugs/bees, you don't want to be looking for the ring. The lens hood is included, but no case. The lens is plastic, but the best-built plastic lens I have ever used. After using the lens for awhile, however, I have thought it might be a better investement to try out extension tubes with a zoom like the 70-200. Optics are excellent in my opinion. When used for macro work, the lens produces tack sharp images with good contrast. The working distance of ~12” is great for both floral, as well as insect photography, and I’ve noticed very little in the way of CA. When shooting on my Nikon D70s, I can’t notice any light fall-off, even when shooting wide open. On my 35mm FA, shooting wide does produce some softness in the corners, but things improve quickly when stopping down to f/4. As a portrait lens, I have been very satisfied with the images that this lens produces. In my opinion, the bokeh is great (thought not as good as what you could produce with say a Nikon 85mm f/1.4), and the lens has produced some overall great results. Build construction is fantastic. I tend to focus manually when shooting close-up, and the one clutch mechanism works great. The focus ring has the viscous feel of a true good old MF lens and offer the right level of fine tuning for my purposes. If you plan on taking your equipment out in the field, I’m pretty confident that this Tokina will last for a long-time. The focus ring is quite wide, and offers overall good handling. Not too surprisingly for a macro, AF speed is not the lens’ strong suit. On my D70s, I’ve found the lens prone to hunting, with the condition exasperated when using anything but the center AF sensor. Using the limiter switch on the lens does help, but you won’t be happy with this lens if you photograph a lot of moving objects and are trying to use dynamic focus mode on your camera. Overall, an excellent lens that I highly recommend.